Benefits Of Wearing Bracelets and Finger RingsBeneficial for elevating energy levels,Protection from Radiation & EMF,Reported as being beneficial for pain relief,Stabalises your bodies natural frequency,Beneficial for severe nerve damage in wrists, thumbs, knees, and shoulders,Neutralises the harmful effects of electromagnetic and geomagnetic frequencies,Compatible with all forms of energy healing and healing devices,Relaxes stiff wrists and shoulders in a few hours,Beneficial for headaches, reported less when wearing for at least 20 hours per day. They work very well on people that has balance and equilibrium problems like tinnitus for example; or people with articulations or muscles problems. 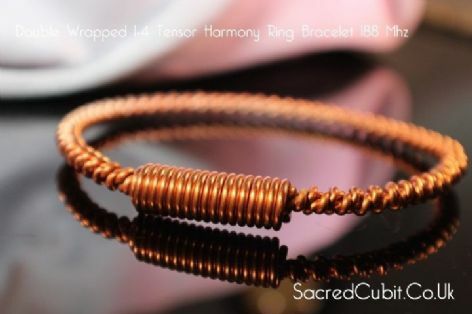 It will maintain the body aligned and will send more flow of energy and oxygen through the hands and arms straight to both brain hemispheres, if using bracelets in both wrists. Relieves arthritis, rheumatism and other body pains. Double twist has more power, energy. Tensor rings also form what is called a 'tensor field' across the opening of the ring. Those who perceive subtle energy describe a beam of energy (light) that passes through a tensor ring traveling for a considerable distance in both directions. Within a tensor ring there is an infinite source of energy that is neither electric nor magnetic with an output that is beneficial and healing to all life forms. Beneficaial for headaches, reported less when wearing for at least 20 hours per day.